In February we’re joining Aris Nikolaidis to discuss The Fate of Representation, the Fate of Critique, chapter six in Jesse Cohn’s 2006 book Anarchism and the Crisis of Representation: Hermeneutics, Aesthetics, Politics. DOWNLOAD Cohn, Jesse (2006). The Fate of Representation, the Fate of Critique. In Anarchism and the Crisis of Representation: Hermeneutics, Aesthetics, Politics. Selinsgrove: Susquehanna University Press, pp. 115-151. Enrico Baj  The Funeral of the Anarchist Pinelli. Textured offset colour print, 75 x 68 cm. Edition 200. 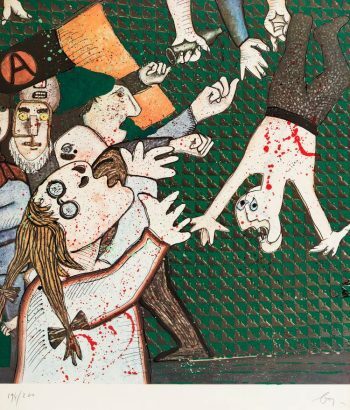 Jesse Cohn’s book Anarchism and the Crisis of Representation is a contribution to the debates over modernism and postmodernism from the perspective of anarchist scholarship. Its starting point is the crisis of representation: as Fredric Jameson argued in his famous foreward to Lyotard’s book The Postmodern Condition, this crisis concerns the conception of representation as the reproduction of an objectivity that lies outside it, and the concomitant projection of “a mirror theory of knowledge and art, whose fundamental evaluative categories are those of adequacy, accuracy, and Truth itself” (1984: xiii). 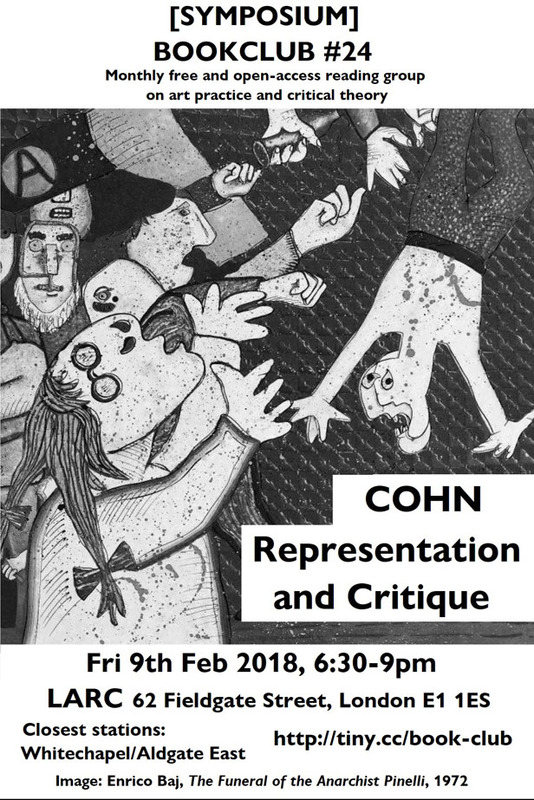 Cohn’s book engages with a wide spectrum of critiques that call into question the relationship between concept and truth, image and reality, political institutions and collective interests, and hold that the practice of representation is indistinguishable from the assumption of power over what it claims to represent. The book explores nonrepresentational alternatives, and in particular the potential of an anarchist critique of symbolic and political representation as a way out of the existing dilemmas and difficulties: for how can knowledge and critique be articulated if there is no position outside the discourse to articulate them from? The book is organized in three parts – hermeneutics, aesthetics, and politics – which may also be related to three distinct areas of study; first, the field of discussion and debate within anarchist scholarship with regard to the impact of post-structuralist theory and the emergence of post-anarchism; second, the literature on the relationship between art and anarchism and its dissident potential in a historical as well as in a contemporary context; and third, the discussion over the influence of anarchism on contemporary social movements – ranging from the Zapatistas to Occupy – that practice direct democracy on the basis of counter-hierarchical, inclusive and participatory forms of organization. Chapter 6, The Fate of Representation, the Fate of Critique, begins with the question of whether a radical aesthetic must reject representation altogether, as in escaping it, or return to it, as in reclaiming and redefining it. The chapter offers a distinction between the social level and the aesthetic level on the basis of which it examines modern as well as postmodern anarchist critiques of representation. It explores the failures of both as aesthetic and political projects due to their individualism and co-option by capitalist culture; and it is in this respect that the book opens up a discussion on the need for a social anarchist aesthetic. [SYMPOSIUM]#24 Cohn Representation and Critique. Flyer by Aris Nikolaidis. How is modernist art related to the politics of anarchism? To what extent is Abstract Expressionism exemplary of the failure of anarchist modernism? Consider the cases of avant-pop and TAZ (temporary autonomous zones); to which extent do they demonstrate the failure of postmodern anarchism? Aris Nikolaidis studied sociology, completed a PhD in media and communications at Goldsmiths and has been involved in free and self-organised language programmes for migrants and refugees. He is teaching and researching in the field of social theory and media studies from a critical perspective, which is to say that he is at odds with marketization, careerism and precarious labour conditions in the university.